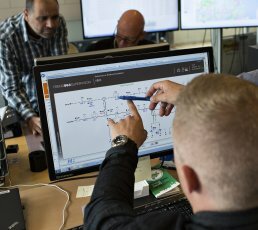 Copenhagen is the first city to digitize energy consumption data in municipal buildings in order to save energy and plan for efficiency upgrades. Copenhagen Municipality is working with utility companies to instal extensive energy and water surveillance systems in all municipal buildings, providing data that can be studied and analyzed from one central platform. Using high-resolution data from smart electricity, heating and water meters, the city can identify leaks in real time and plan strategic upgrades for inefficient buildings. The scheme, which has a payback time of just six years, is unique in that it combines information from many building management systems on one platform. In the first quarter of 2018, the system retrieved consumption data from 550 properties and 482 of the municipality’s technical facilities. In 2017, the City of Copenhagen saved equivalent to 1,559 tonnes of CO2 on electricity and district heating. In the same year, the system helped to reduce water leakage by 5,300 liters per hour. When the system is fully operational by 2020, 40% of energy consumption in the municipality’s properties is expected to be reduced compared to 2010, saving around 4 million EUR per year through improvements to efficiency. Copenhagen has achieved significant economic and environmental savings through digitizing and monitoring energy consumption data. By digitizing and centralizing surveillance, the energy consumption of municipalities is guaranteed to be as responsible and minimal as possible. The project helps to achieve the goal in the municipality's climate plan of reducing energy consumption in buildings by 40%, and thus reduce related CO2 emissions. Development and operation takes place in close cooperation between the municipality, utility companies and other property owners in order to share knowledge about energy monitoring and management.